Countdown To JoeLanta and The Great Atlanta Toy Convention: 4 Days To Go! We’re just four days away from JoeLanta and The Great Atlanta Toy Convention, and your PopCulteer is in full toy-lust mode. 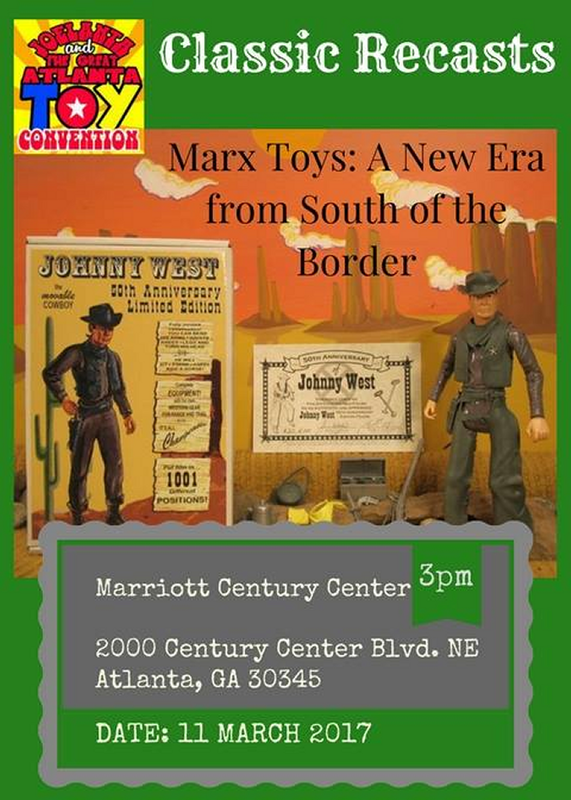 One of my favorite toy people in the world, James Wozniak, the owner of Classic Recasts, will not only be in attendance as a dealer, but he’s also moderating a panel that will focus on the plethora of new product coming out of Mexico that’s made using the original Marx molds. James will relate the story of how he hooked up with Jean Zabre and his family to renew interest in the legacy of Marx Toys. James is one of the masterminds behind the anniversary editions of Johnny West and Sam Cobra that I’ve raved about here in PopCult, and he’s bringing his latest projects to Atlanta. My wallet is going to be seriously lighter after picking up all the figures he’s had made using the original Daniel Boone molds, and I’m also going to be snagging some brand-new Universal Monsters, in never-before-used colors. James will be talking about what he knows of the Marx molds, and how they’re still being used, some of them more than fifty years after they were created. There’s plenty to learn about the Zabre family and their connections to the Marx Toy Company, and James is the guy to teach that lesson. His panel is one of the ones the PopCult cameras will be recording this year (we’re going to record quite a few, but we can’t get them all). JoeLanta and Marx Action Figures? There’s no way I’m missing that. Keep checking PopCult for more info on JoeLanta and The Great Atlanta Toy Convention.